13.4" x 19.7" stitched on 14 count. 10.4" x 15.3" stitched on 18 count. 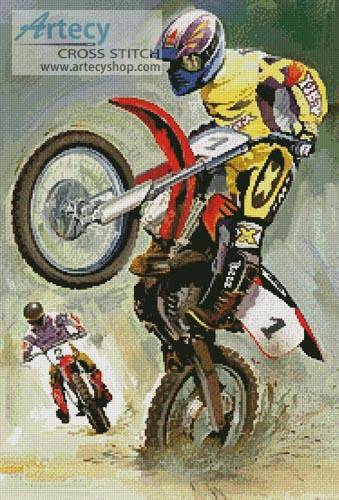 Off Road Riders cross stitch pattern... This counted cross stitch pattern of a Off Road Motorbike Riders was created from the beautiful artwork of Luis Bargallo. Image copyright of John Zaccheo/ Art Licensing Int'l. Only full cross stitches are used in this pattern.